It's gotta be worth a lot of money. ...and I'm sure 9-11 is somehow responsible too. P.S. - that's including drive time, and I'm sure an obvious joke about the price of gasoline could be worked in as well. Which kind of bridges the gap between the value of the unit and kaden's "9/11" comment. Just for posterity's sake, it's worth pointing out that Radio Shack won't have roughly a third of the components. ;-) Total cost from Small Bear for everything you need to build a Rangemaster is about $45. By the way, original poster: your title says "Rangmaster". 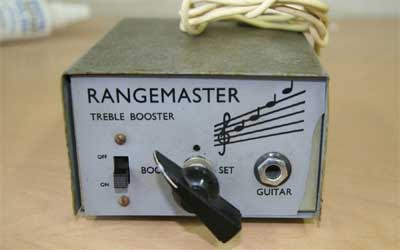 I have a Walco Bass Treble Booster from the early 70's in very nice condition, much nicer than the Rangemaster. I should put it up on Ebay, claim it's vintage, well, it is, and ask five hundred dollars. Unfortunately, I bought it off Ebay about a year and a half ago, and spent about ten dollars on it (which includes shipping!). So maybe I should just put it on another countries Ebay!! It's just a maximum simple EQ that adds some distortion from it's simple 20$ parts. btw: someone REALLY spent 2025£ for another one? i love the photography on the echoplex page - not just because it's beautiful, but because it's knowingly wanton gearporn. Having played through a real Dallas Rangemaster, they are truly the shi*t!! Even if you try to build one, try and find a NOS, mid 60's, quality germanium transistor. It is the old parts and the serendipity of all the hand made parts that came together to overdrive a good tube amp just so. Only 300 were ever made. Ask Billy Gibbons, Brian May, Toni Iommi, et al who used them(listen to Beatles "Happiness is a warm gun" guitar work, definitely a Rangemaster!) then to get there most memorable tones and still even now!! Not for everyone, how many find themselves playing Rock 'n' Roll through a nice british tube amp in front of a crowd of 5000+ people? I am sure they would have liked to have kept them a secret and been able to keep the price low....but, ah, collectors! Simply, there is no other way to get "That" tone. No re-issue comes close. A NOS one did sell for $4K, but a dinged up one not 100% original just sold for the same on eSchmay. It's worth what someone will pay for it, which is rather high, depending upon condition, because with only 300 made in 1966 it's got rarity. Most people play through a clone, which doesn't come close, and say, 'What's the big deal? '...and I'm sorry a Walco Treble/Bass boost doesn't even come close(you must have never played thru an original!) and definitely don't waste your time with "spam in a can" modern Marshalls(total garbage!)!! A 60's Silvertone Twin Twelve for $500 or less is 1000% better! If you are fortunate and the guitar Muses smile upon you play through or better yet, get an original and play it through a mid to late 1960's british tube amp! And let's face facts. The real transistors used in the originsal Rangemasters - the OC71's and OC44's, which are showing up on ebay, are far east knock-offs. Not the read deal at all. There is virtually ZERO amount of NOS OC's available in the market right now. Every once in a while, a few real deal units turn up, but that is it. Sadly, what is being sold on ebay is really good looking fakes. I have purchased many to compare them on a Tektronix 576, as well as other very sophisticated equipment. I have also "taken them apart", and done extensive destructive testing of them. None were real. Even more interesting is that chromatography and xrf alloy analysis of materials used are modern rohs compliant materials, unlike the real units. Oops! The knock-offs sound nothing like the real deals. And no, you can't get these from your local Rat Shack.